I am not a car chick. While I can appreciate a nice car, it is mostly for its looks and pretty color rather than for the horsepower or what is under the hood. If I like it, I like it. And let’s be honest, can anyone whose dream car is a Fiat 500 really be considered a car person? While I don’t know if one would consider my husband “a car person”, he certainly has an appreciation for anything with wheels and a motor. He is obviously more attracted to Italy’s prowess in the automotive industry than he is to Prada, Gucci or Bruno Magli. It’s all about balance and that it is why it is nice to have him tag along to events. He sees a side of Italy that I would gloss over. A side that is actually fun, fascinating and appealing to a whole other population. Case in point: several years back we went to the NYT Travel Show in search of inspiration and to explore some of the growing trends in the travel industry. I honed in on the culinary and artistic side of tourism while Doug was immediately drawn to the Bresciatourism booth and their feature on the Mille Miglia. Until that day, I knew nothing of this 1000 mile classic car rally that takes place every year in Italy. Over 15 years of experience in the Italian travel business and I was being introduced to something new (to me) and seemingly pretty special and fabulous. We had a lovely chat with the representative at the booth and somehow got ourselves invited on a press trip to attend the Mille Miglia the following year. It was an experience I will never forget. 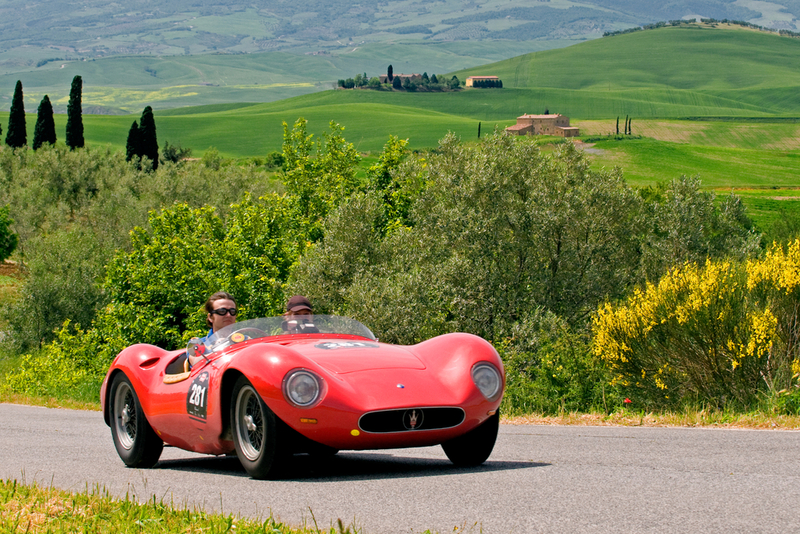 The Mille Miglia is a classic car rally that takes place every year in May. The original open road endurance race was held annually from 1927 to 1957 (with a few years off for a little disagreement we call WWII). The race was banned after two fatal crashes in 1957 but it was revived in 1977 as a parade of classic cars and it has become star studded event for car afficianados and history buffs alike. The Prince of Holland is a regular entrant and vintage cars that were in the original endurance race are shipped in from all over the world. The race starts in Brescia, not far from Lake Garda in Northern Italy. There is a day of celebration with the cars all on display in the main squares of the town. The atmosphere is electric and the photo ops of the cars with historic buildings as a backdrop are unparalleled. The rally makes its way down the peninsula to Rome and then returns to Brescia three days later. There are stops along the way so people can see the cars, experience the Mille and so the participants can do a little celebrating themselves. The beauty of going to the Mille Miglia is that the area around Brescia is so rich - you can easily make a week (or more) of it, incorporating the race into your vacation. Lake Garda is a perfect place to use as a home base. Less well known than Lake Como, I am personally more enamored with Garda than Lake Clooney. The towns that line the lakeside are treasures and the vibe is decidedly low key. From Desenzano on the south end of the lake, you can get to Verona in 40 minutes, Brescia in 30 minutes, the beautiful wine country of Franciacorta in under an hour. This overlooked area is not to be missed. The 2015 Mille begins tomorrow and every year I am a bit sad that I am not there. This is truly a unique experience for anyone who is looking to see a different side of Italy. While it’s too late to get there this year, it is not too early to plan on it for 2016. Whether you are car lover or not, the Mille Miglia is wonderful event that can be perfectly combined into a northern Italian holiday. Call me today and we can plan the adventure of a lifetime together.